Nuclear energy currently provides around 11 percent of the world's electricity. China, the European Union, the United States, India, Russia, South Korea, and other nations’ have major existing fleets. The World has hundreds of units under construction and proposed. And, existing reactors which have reached their original estimated operating lives are being relicensed. These factors, together with recent limited investment in new uranium exploration and development, might be good indicators of future improvements in uranium markets for potential investors looking at the sector. 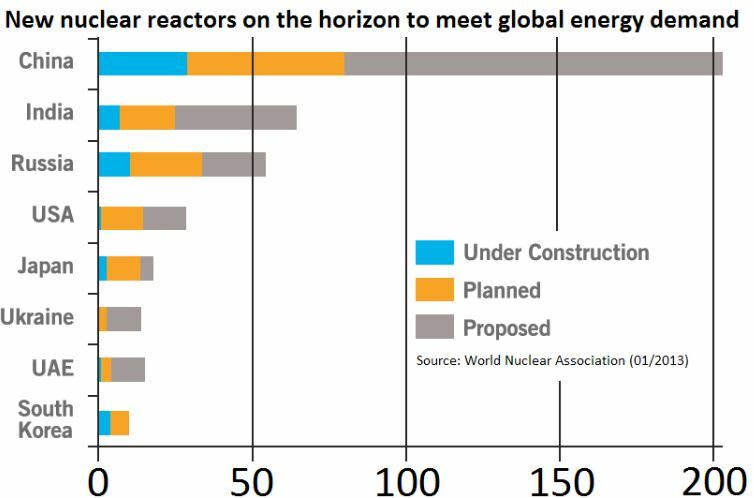 According to the World Nuclear Association, China has 27 nuclear reactors in operation and another 27 under construction, with almost 100 more planned by 2030. Some of the world's most advanced reactors will give China a three-fold increase in nuclear capacity to at least 58 gigawatts by 2020-21 and a further 150GW by 2030. China has also committed to an ambitious target of building around 30 nuclear power plants in countries along the One Belt and One Road initiative by 2030. India is also in the midst of a major expansion of nuclear-power generation. Their target is to generate 25 percent of electricity from nuclear power by 2050, that’s up from four percent in 2013. Canada's Cameco, the world's largest listed uranium mining company, signed a five-year deal with India’s Prime Minister Narendra Modi to buy 3,000,000 lbs. of U3O8 annually to supply fuel to Indian nuclear reactors. Electric vehicles (EVs) have far fewer moving parts than Internal Combustion Engine (ICE) gasoline-powered cars – they don't have mufflers, gas tanks, catalytic converters or ignition systems, there’s also never an oil change or tune-up to worry about. Driving performance is excellent, prices are dropping … plug and go, convenient and very green! “A year's operation of a 1,000-MW coal plant produces 1.5 million tons of ash – 30,000 truck loads, or enough to cover one and a half square miles to a depth of 40 feet – that contains large amounts of carcinogens and toxins, and which can be highly acidic or alkaline depending on the sulfur content of the coal. Also, ironically, more unused energy is thrown away in the form of trace uranium in the ash than was obtained from burning the coal. Getting rid of it is a stupendous task, and it ends up being dumped in shallow landfills that are easily leached out by groundwater, or simply piled up in mountains on any convenient site. And that's only the solid waste. In addition there is the waste that's disposed of up the smokestack, which includes 600 pounds of carbon dioxide and ten pounds of sulfur dioxide every second, and the same quantity of nitrogen oxides as 200,000 automobiles. An equivalent-size nuke, by contrast, produces nothing in addition to its cubic yard of high-level waste, because there isn't any chemical combustion. Nuclear power's life-cycle emissions range from 2 to 59 gram-equivalents of carbon dioxide per kilowatt-hour. Only hydropower's range ranked slightly lower at 2 to 48 grams of carbon dioxide-equivalents per kilowatt-hour. Wind comes in at 7 to 124 grams and solar photovoltaic at 13 to 731 grams. Emissions from natural gas fired plants ranged from 389 to 511 grams. Coal produces 790 to 1,182 grams of carbon dioxide equivalents per kilowatt hour. Nuclear power has avoided the release of an estimated 56 gigatonnes of CO2 since 1971. That's almost two years of total global emissions at current rates. Kazakhstan is the world's biggest uranium producer, followed by Canada and Australia. Kazakshtan has been the world's largest uranium producer since 2009, accounting for 41% of world production in 2014. By 2020, China alone will consume the equivalent of one-third of today’s global uranium market. China and Russia have already begun aggressively buying up huge stakes in uranium mining operations around the world in order to stockpile uranium to meet their rising domestic demand .” Virginia Uranium Inc.
Also according to the EIA's Uranium Marketing Annual Report of the uranium purchased by US reactor owners and operators, 40% was of Kazakh, Uzbek, and Russian origin, while 20% came from Australia and 18% from Canada. Short but ominous note from the world's largest uranium-producing nation this week. Suggesting that some unpleasant surprises could be coming for the mining sector here. The place is Kazakhstan. Where the country's president said the government may be about to take some drastic action against foreign operators in the uranium industry. Speaking at a meeting with national uranium miner Kazatomprom, President Nursultan Nazarbayev said that Kazakhstan may soon look to "reclaim" some assets from mining companies. With the president saying that the action is necessary because firms are "not meeting their obligations" when it comes to mine development. As Nazarbayev put it, "In this regard it is necessary to either ensure that they meet their obligations or look into reclaiming those assets in the interests of our state." That's a serious warning from the government. Especially given that Kazakhstan's uranium sector has attracted considerable foreign investment over the last several years — including from Areva, Cameco, and Sumitomo, as well as Russian and Chinese developers. The government didn't elaborate as to which of these project holders are not pulling their weight. But the warning suggests all of these companies could see their ventures come under scrutiny, if they're seen to be advancing too slowly. It's even possible that this whole argument could simply be a pretext for re-enforcing greater state control of the mining sector. Or a means of clawing back choice assets in order to award them to more politically-palatable partners. 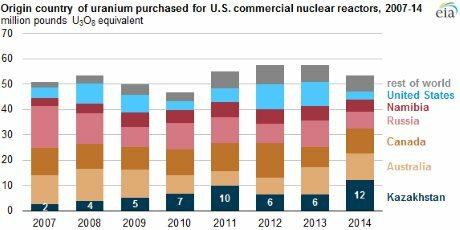 The USA, and most other countries, are highly reliant on foreign sources for their uranium – in 2014 54% of world production came from just ten mines in six countries, with these six countries providing 85% of the world's mined uranium. In 2016, the company expects to produce about 1 million pounds of uranium utilizing both in situ (“ISR”) and conventional mining techniques. All of the company’s uranium is sold to global nuclear utilities, but with a focus on U.S. electrical generation. The company believes that being the leading name in the U.S. uranium sector is highly strategic, as the U.S. is currently the World’s leading producer of nuclear energy – and consumer of uranium. company expects to accelerate production growth. The company also owns several projects in the vicinity of the Nichols Ranch ISR Plant. This includes the Jane Dough Project, a new wellfield which will be connected to the Nichols Ranch Plant via pipeline. The company expects the Jane Dough Project to be fully-permitted by early 2017. The company also owns the Hank Project, which is currently licensed to be constructed as a satellite plant and well field to the Nichols Ranch Plant. 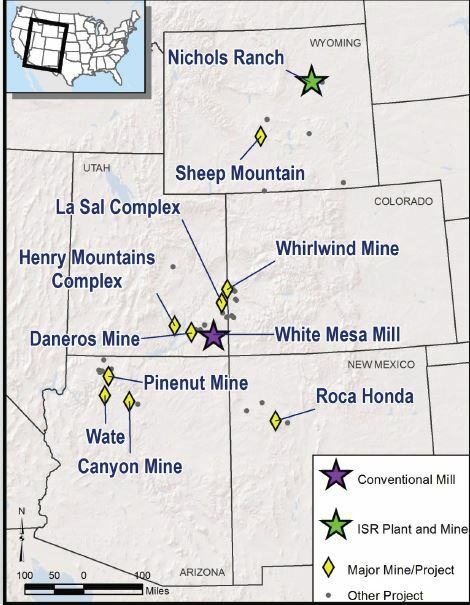 Finally, the Company controls over 70,000 acres in the Powder River Basin that contain both identified ISR-amenable uranium resources and significant exploration potential. As the world’s population and standard of living continues to climb, demand for more – and cleaner energy – grows alongside the pressures we continue to put on our environment. 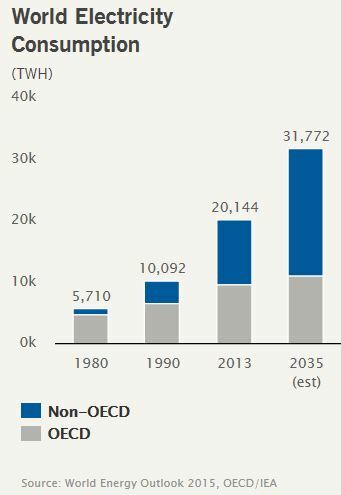 Increasing demand, coupled with decreasing, over the long term, supply, results in a growing gap because adding new reactors increases the demand for uranium, while at the same time, secondary supplies are diminishing and primary producers are experiencing economic challenges making it difficult to bring new production on line. There is no shortage of uranium in the ground – there is enough to meet expected demand for the foreseeable future (Uranium has an average concentration of 2.8 parts per million in the Earth's crust. It is more abundant than gold, silver or mercury, about the same as tin and slightly less abundant than cobalt, lead or molybdenum). However – exploration for new deposits has fallen dramatically and with lead times to build a mine a decade and more, the mining industry looks like it is not going to have enough supply to meet the increased demand. There already exists a significant uncovered long term uranium requirement. 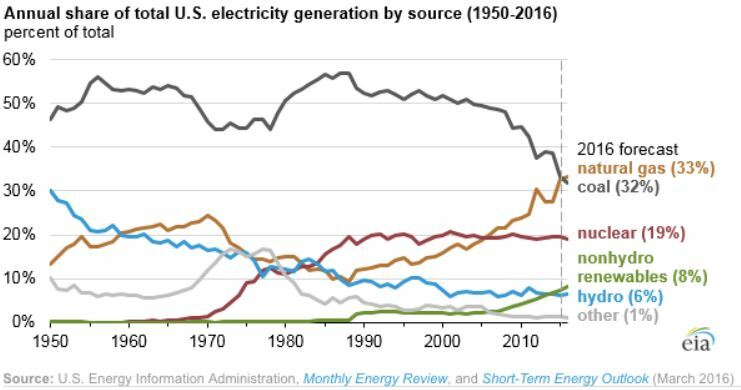 With so many projects deferred or cancelled outright, with existing mines shutdown and with continued demand growth from other regions of the world it’s going to become increasingly difficult for utilities to meet uncovered uranium needs let alone a coming expansion of nuclear energy to play a major role in addressing global climate change. 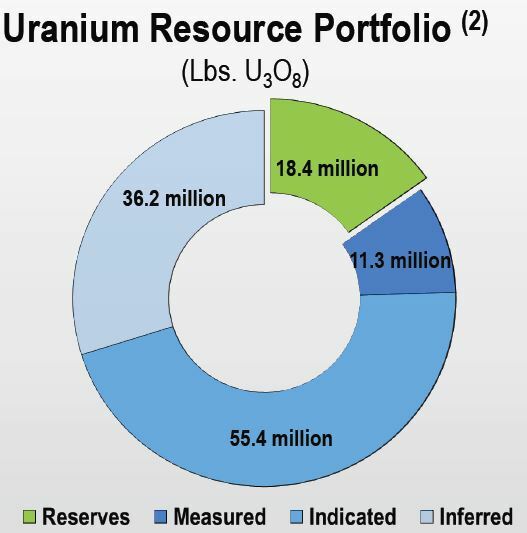 Globally mined uranium is far from abundant. It can take 11 or more years to develop, permit and build a mine. 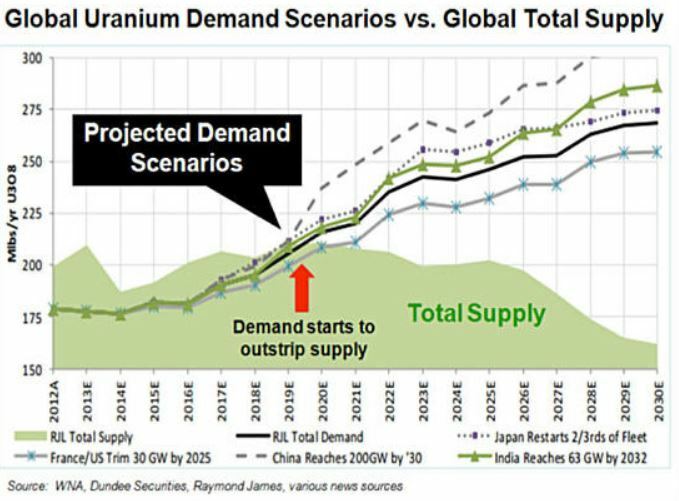 Uranium demand could more than double over the next 16 years. The coming (but unrecognized by most) uranium supply pinch is not going to go away for a very long time. Have you got the coming global mined uranium shortage, Energy Fuels (as a U.S. based producer), de-carbonizing our energy sector and combating global warming on your radar screen? Please visit www.aheadoftheherd.com – We’re telling you things everyone else doesn’t already know. Moderated investor friendly forums – Ahead of the Herd is powered by Community Intelligence. Free highly acclaimed newsletter featuring today’s investable junior resource companies.